Four students from St Sampsons High School have teamed up for the business challenge. 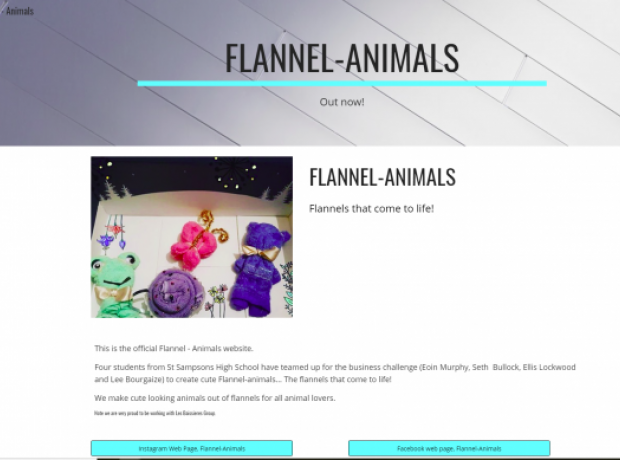 Eoin Murphy, Seth Bullock, Ellis Lockwood and Lee Bourgaize have created cute Flannel-animals. The flannels that come to life! Thy have made cute looking animals out of flannels for all animal lovers. On sale at the GSPCA and at events and at Town every Saturday. Each cost only £2 and for each one they will donate to the animals at the GSPCA. The aim of the company is to show people that local product are just as good as from other retailers. Georgia Winstanley, Amber Guillemet, Chloe Spruce and Amelia Potter all 13 years from St Sampsons High School this year teamed up together earlier this year to create their company E-Cozy.